Biology: As Scientific Inquiry comes bound as eight separate units. Each unit contains text and lab investigations combined. Units I and II are essential and should precede the use of Units III through VIII, which can be used in any order. Selected units can be omitted. A list of necessary lab supplies and equipment for each unit is available upon request if you are planning to order in quantity. 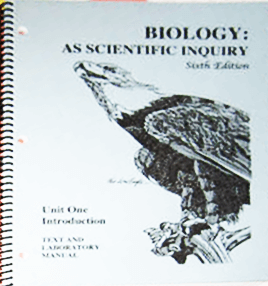 $67.70 — "Biology: As Scientific Inquiry," student set of 8 manuals. The following teacher supplements are available at the listed prices, only if a classroom set of a unit is ordered. Prices of supplements are reduced accordingly if less than 8 units are ordered. Supplement samples are available upon request at no charge. Mail or fax us a district purchase order. Pay through your PayPal Account then follow PayPal's instructions. Add $6.10 to ship one set of 8 manuals to anyplace in the US. Ron Thompson, a 30-year veteran high school biology teacher, has been presented with many other awards for his teaching and curriculum development, including the Christa McAuliffe Fellowship and Washington State Science Teacher of the Year. He personally met President Clinton at the White House when receiving the Presidential Award for science teaching. Mr. Thompson is currently teaching science teacher interns at Seattle Pacific University. He also provides high quality workshops for K-12 science teachers across the nation. 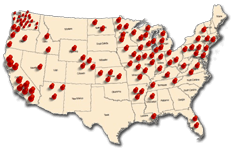 He has conducted in-service programs in most major US cities. For more information on workshops and in-service programs please email Ron.